enter your Zip Code and click Go! and follow the instructions to contact your representative. The bill is so new the text of the bill is not yet displayed in THOMAS. 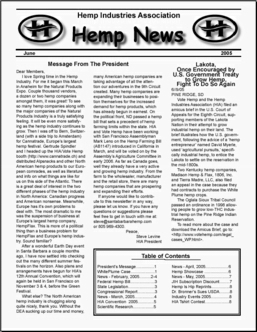 Here is the THOMAS link: Industrial Hemp Farming Act of 2005. Here is our PDF of H.R. 3037. Representing farming interests at the event was North Dakota Agriculture Commissioner Roger Johnson. "Industrial hemp is used in a tremendous variety of products, including food products, soap, cosmetics, fertilizer, textiles, paper, paints and plastics," Johnson said. "Once the crop is legalized in this country, I believe science will find even more uses for industrial hemp, uses that will make industrial hemp a popular and profitable crop." North Dakota State Rep. David Monson, (R-Osnabrock), a farmer who successfully sponsored several bills in the North Dakota Legislature regulating the production and research of industrial hemp said, "Industrial hemp production is on hold in North Dakota and the entire U.S., due to roadblocks in Washington D.C.," Monson said. "We have had tremendous bipartisan support for legislation we've introduced in North Dakota." U.S. companies that manufacture or sell products made with hemp include Dr. Bronner's Magic Soaps, the number-one-selling natural soap, Interface, the world's largest manufacturer of commercial carpet and carpet tiles, FlexForm Technologies, an Indiana company whose natural fiber materials are found in 1.5 million cars, Alterna, a professional hair care company whose hemp products are beloved by Julia Roberts, California based Nutiva Hemp Foods and adidas USA which has been selling hemp sneakers since 1995. Although hemp grows wild across the US, a vestige of centuries of hemp farming, the hemp for these products must be imported. There is widespread support among national organizations for a change in the federal government's position on hemp. The National Association of State Departments of Agriculture "supports revisions to the federal rules and regulations authorizing commercial production of industrial hemp." The National Grange "supports research, production, processing and marketing of industrial hemp as a viable agricultural activity." Individual states have also expressed interest in industrial hemp. Twenty-six states have introduced hemp legislation and six, Hawaii, Kentucky, Maine, Montana, North Dakota, and West Virginia, have removed barriers to its production or research. Representative Paul's bill will allow laws in these states regulating the growing and processing of industrial hemp to take effect. "Industrial hemp has become a lucrative crop for farmers in Europe, Canada and Asia, so farmers here are asking "Why are we being left out?'" says Alexis Baden-Mayer, Director of Government Relations for Vote Hemp. For thousands of years different varieties of Cannabis have been cultivated for non-drug uses such as paper, canvas, soap, food, building materials and recently high-tech bio-composites used in automobiles. Hemp and marijuana come from different varieties of the Cannabis plant. "Because there are millions of cars on the road with hemp door panels, tens of millions of dollars spent annually on hemp food and hemp body care and hemp paper is being made in the U.S., people are asking tough questions about why the U.S. government won't distinguish low-THC hemp from high-THC drug varieties. I believe this federal legislation will gain momentum over the next year as we spend time educating Congress and their constituents about the need for reforms," says Baden-Mayer. For more information on industrial hemp, please visit http://votehemp.com, the website of Vote Hemp, a non-profit organization dedicated to the acceptance of industrial hemp. At long last a hemp bill has been intoduced in Congress. The bill number is H.R. 3037, the bill's Short Title As Introduced is Industrial Hemp Farming Act of 2005, and Official Title As Introduced is "To amend the Controlled Substances Act to exclude industrial hemp from the definition of marihuana, and for other purposes." Please note that the information below comes from THOMAS which is a service of the Library of Congress. It is named after Thomas Jefferson, a founding father, statesman, hemp farmer & breeder. By Mr. PAUL (for himself, Mr. Farr, Mr. McDermott, Mr.
Mr. PAUL. Mr. Speaker, I rise to introduce the Industrial Hemp Farming Act. State laws allowing the growing of industrial hemp. must be imported instead of being grown by American farmers. restriction on American farmers and allow them to grow industrial hemp in accord with State law. of industrial hemp is in the door frames of about 1.5 million cars. Hemp has even been used in alternative automobile fuel. up for American farmers and cosponsor the Industrial Hemp Farming Act. The new June 2005 HIA Newsletter is out. You can download it from The Hemp Report. Please click here or on the PDF logo below. It is a 1.4 MB file. Last week I was reading some hemp news clippings and I came upon this gem "Cook wrote the book on local hemp fields" in the Intelligencer Journal in Lancaster County Pennsylvania. I emailed Les Stark, the author of the new hemp history series Hempstone Heritage and asked him if I could plug his book here on The Hemp Report. He emailed me this noce cover shot and a press release that was sent out to local libraries. I hope that you all take the time to order Les' new book at the Hempstone Heritage web site. All too much hemp history in North America has been lost and only efforts like this will help restore hemp's place in the history books. New Book by Pennsylvania Author Reveals Previously Unknown History of Early Pennsylvania Hemp Insustry. Important Discoveries Made. My name is Les Stark and I am from Ephrata, in Lancaster County, Pennsylvania. I would like to tell you a bit about my book, Hempstone Heritage I: In Accordance with Their Wills; "All the Heckled Hemp She Can Spin"- A Study of the Early American Homespun Hemp Industry as Revealed by the Wills of Old Lancaster County, Pennsylvania: 1729-1845. The book is the first book in a series that will explore the old Pennsylvania hemp industry. Hemp was a big industry in early Pennsylvania but for some reason the story has never before been told. Although the growing of hemp for fiber was grown in all parts of Pennsylvania, larger scale commercial production of hemp was primarily centered in Lancaster and York Counties. Between the years 1720-1870 there were over 100 water- powered hemp mills for processing hemp fiber in Lancaster County alone and there were dozens more in York County plus many more in the surrounding region. Before the invention of the Cotton Gin and for decades after, hemp was the number one fiber for use in homespun clothing. Hemp fiber was used for everything from course cloth to fine linen and all shades in-between. The Conestoga wagons were covered in hemp canvass. In fact the word canvass is the Dutch pronunciation of the Latin word Cannabis. Hemp was also used for grain bags, rugs, curtains, tablecloths, napkins, handkerchiefs, towels, pillow cases, sheets, tough, durable work clothes and even fine linen. Hemp fiber was often blended with wool, flax, silk or cotton. The tow fibers were carded like wool and made very soft. The fabric was often dyed and made into a variety of fashions. There were almost as many mills for processing hempseed oil as well as flaxseed oil. The oil was used in paints, varnishes, laquers, lubricants, printers' ink and as lamp oil. The remaining seed cake was fed to the livestock. Seed was also saved for the next years crop, sold to other hemp farmers, used as poultry feed and for many years was a leading ingredient in birdseed mixes. In November of 2000, the Lancaster Farm Bureau advanced the issue at the Pa. State Farm Bureau meeting and every Farm Bureau representitive from every farm district in Pa. voted in favor of the resolution supporting the re-introduction of hemp to Pennsylvania. At the recent state session for the Pennsylvania State Grange, the standing committees voted in favor of a resolution to "support developement of industrial hemp research and education on its use." The Pennsylvania Farmers Union also supports growing hemp. Philadelphia was a major manufacturer of sailing ships. Wherever there was a major ship building center there was always a major hemp growing region right next door. Every ship took up to 60 tons of hemp fiber for the anchor cables, rope rigging and canvass sails. All that fiber had to be replaced every couple of years, thus ensuring an insatiable demand for hemp from the interior of Pennsylvania. Hempstone Heritage I contains important information that Pennsylvanians need to know. Ordering information can be found at Hempstone Heritage.